Halophytes have a great potential in their use as cash crops for fodder, medicine, and other aspects. These saline habitat plants flourish on soils with high salt concentration and can be substituted for conventional crops. A total of 728 taxa of halophytes have been recorded from Southwest Asia. These belong to 68 families. The majority are from the families Chenopodiaceae, Poaceae, Leguminosae (Papiliondeae), Asteraceae, and Cyperaceae. Chenopodiaceae has the largest number of species and genera. It is exceeded by Poaceae which has more genera but fewer species. Halophytes in this region constitute about half the number of halophyte taxa (and families) recorded for the world. A total of 115 halophyte taxa are evaluated as food here together with a total of 331 as fodder. Especially in the Arabian Gulf countries, Aerva javanica, Aizoon canariense, Blepharis ciliaris, Cleome brachycarpa, Convolvulus glomeratus, Haloxylon salicornicum, Leptadenia pyrotechnica, Lycium shawii, Senna italica, Tecomella undulata, and Zaleya pentandra halophyte taxa are good fodder for camels, cattle, goat, and sheep. In the Mediterranean part of Southwest Asia, more than 20 taxa are used as animal feed. These are mainly the taxa like Aellenia, Aeluropus, Halocnemum, Haloxylon, Salsola, Sarcocornia, and Suaeda. In Iraq, Iran, Afghanistan, and Pakistan, the number of halophytes used as animal feed exceeds 100 taxa. 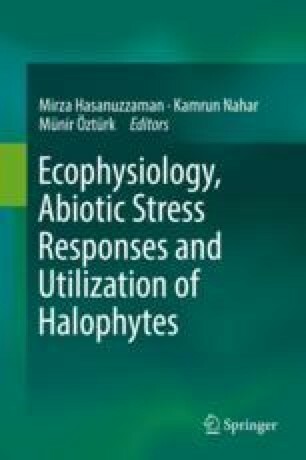 The use of halophytes for food purposes in Southwest Asia is as follows: Mediterranean countries use over 10 taxa, Arabian Gulf countries use over 10 taxa, and Iraq, Iran, Afghanistan, and Pakistan use over 40 taxa.